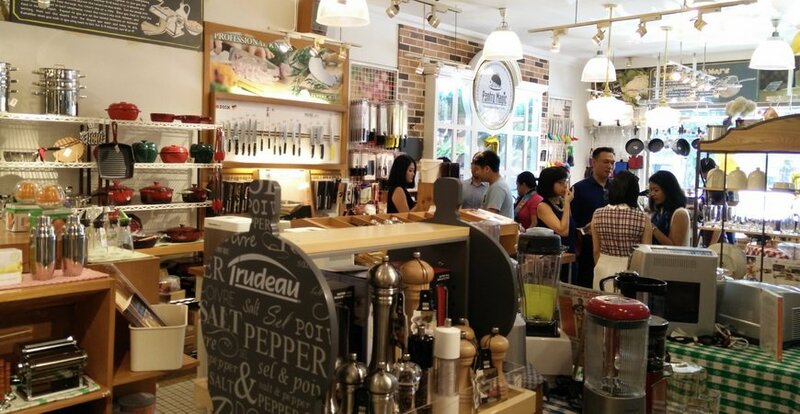 Pantry Magic Jakarta, a cookingware and bakingware shop offering high-quality cooking experience at home, celebrated its birthday on November 14th 2015. This event was supported by numerous rising Indonesian products such as Suwe Ora Jamu, Sababay Wine, Ketan Pasar, and Eskimomo. Featuring “Food of Your Hometown” theme, Pantry Magic and Suwe Ora Jamu held a “Homebrew Jamu” workshop. Bara Pattiradjawane also jazzed this celebration up with “Homage to Our Heritage” cooking demo. Before the occasion, Pantry Magic has held #IMAHOMECOOK challenge on its social media. #IMAHOMECOOK campaign aims to encourage more people to cook at home. This challenge required following Pantry Magic’s instagram (@pantrymagicindonesia), uploading photo of the best home cooked meal next to handwritten #IMAHOMECOOK note with caption telling the story behind the food, and tagging @pantrymagicindonesia with @IMAHOMECOOK hashtag in the picture. The winner can cook together with Bara Pattiradjawane on the anniversary day. Frea Kartika with her @freakartika instagram account won this challenge. As a winner, she was given a gift card worth Rp1,000,000 by Pantry Magic. On the anniversary day, she cooked vegetarian dishes “Crispy Oatmeal Tofu and Tofu Skin with Salsa, Roasted Pumpkin, and Mashed Potato” with Bara Pattiradjawane. Bara Pattiradjawane and Frea Kartika collaborating in a healthy recipe cooking demo. “I am a healthy food lover. Although I’m not really into vegetable, I realized that in order to be healthier, I need to eat this. Thus, I tried to make the vegetable more interesting by cooking vegetarian dish with a twist,” said Frea Kartika before doing her demo. Turmeric jamu workshop held by Nova and Dewi of Suwe Ora Jamu. From Jamu Workshop corner, Nova and Dewi of Suwe Ora Jamu showed the invited guests how to homebrew curcuma jamu. Using fresh ingredients, this recipe only requires 15-30 grams of curcuma for every portion. “Although fresh ingredients have milder taste compared to dry one, we still need to use it moderately. Too much curcuma in your drinks can lead to bitter taste and stomachache,” said Nova. After showing guests how to make curcuma jamu shot from scratch, Nova and Dewi also collaborated with Eddrian Tjhia, a Bangka-specialized chef, to made mango and curcuma smoothies. “Mango is the second most-consumed tropical fruit in the world after honeydew. Mango rich in vitamin A and K while having very sweet, delicious taste. The texture is also great for smoothies,” said Nova. On his cooking session, Bara Pattiradjawane demonstrated Moluccas cuisine’s cooking to celebrate his Moluccas ethnicity. He cooked Papeda (sticky sago porridge) and Ikan Kuah Kuning (fish in turmeric broth), Moluccas dishes that also known in Papua. The freshness of Moluccas’ Kohu-Kohu, a delicious salad served with shredded smoky fish such as cakalang asar, also inspired Bara to make his own take on this dish. “Most Moluccas people eat seafood as protein. Many Indonesian regions have their kinds of fish dishes but Kohu-Kohu is very special for me,” said Bara. Claiming itself as “the” destination for cooking and baking enthusiast in Indonesia, Pantry Magic is not just a shop. It has integrated concepts of cooking tools, cookbooks, expert advice, and event organizing such as cooking class and demo. “We always make our anniversary celebration full of fruitful activities. On every even year, we will have Battle of Young Chefs featuring rookies of Indonesian culinary world. Among of the winners are Karen Carlotta and Arnold Purnomo. On every odd year like this, we will celebrate it with various cooking demos and workshops featuring the rising stars of Indonesian products and chef who cooks Indonesian food,” said Pantry Magic Indonesia Proprietor Chindy Lie. “We indeed sell imported product as it is a Hong Kong franchised store. However, we always celebrating Indonesian food here in Pantry Magic,” said Chindy in the end of the interview.